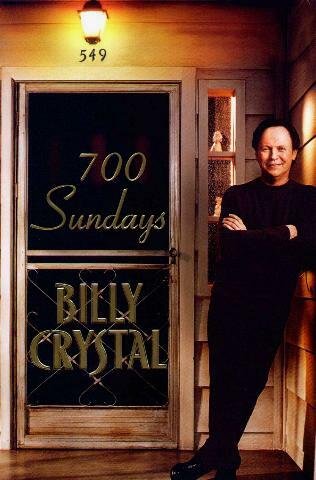 Billy Crystal is one of my all-time favorite comedic actors and my very favorite stand-up comedian and Oscar presenter. His timing is spot on and his wit so sharp, it was a pleasure reading his book. It's about his life with his father (and mother) who died when Billy was just 15 years old. He reckons he spent about 700 Sundays with his dad who worked two jobs and didn't have much spare time to spend with his three sons. Billy relates stories of his youth and meeting many Jazz giants of the time, his musically-inclined Uncle Milt, and his love of baseball and how he met Mickey Mantle. It's much more serious than that, however. His first stand-up gig, at age 9, was at home in front of family and was a great success - he knew right there and then that he wanted to be a comedian. This is a tender story of a home filled with love and enthusiasm for each other, which makes for a very pleasant read - a change from the chaotic lives so many "celebrities" seem to live. Billy Crystal is the product of a happy home. Losing your father at such a young age isn't fun, but it happens, and Billy's support from the whole family, had much to do with how he turned out. Great story! You can almost hear Crystal's voice while reading his book, which for me, made the book that much funnier. Conclusion - Funny, moving, touching, and so Billy Crystal.